Active Galactic Nuclei, or AGN, are centers of galaxies hosting a super-massive black hole that is actively being fed gas and outshines the galaxy at almost any wavelength. These black holes have masses that are a million to billion times larger than the mass of our Sun and an event horizon (the point after which matter and light cannot escape the hole) the size of our solar system. 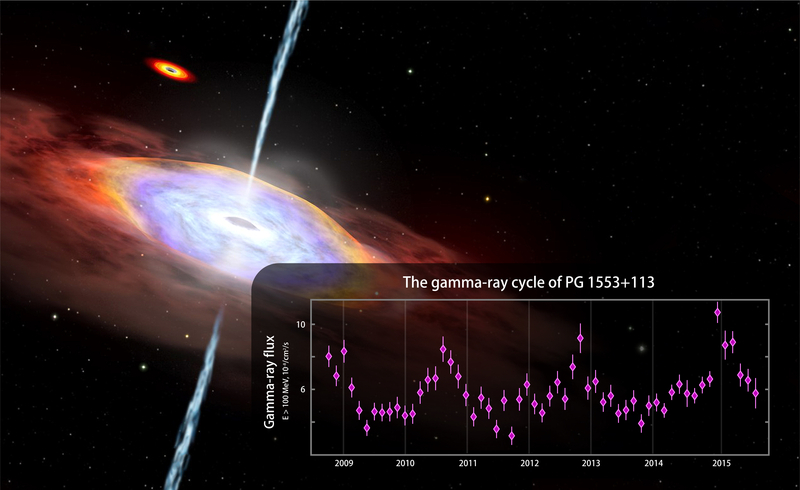 AGN are best studied at high energies and represent the largest population of sources detected by the Large Area Telescope (LAT) on board the Fermi Gamma-ray Space Telescope. White circles represent Fermi-detected Active Galactic Nuclei. 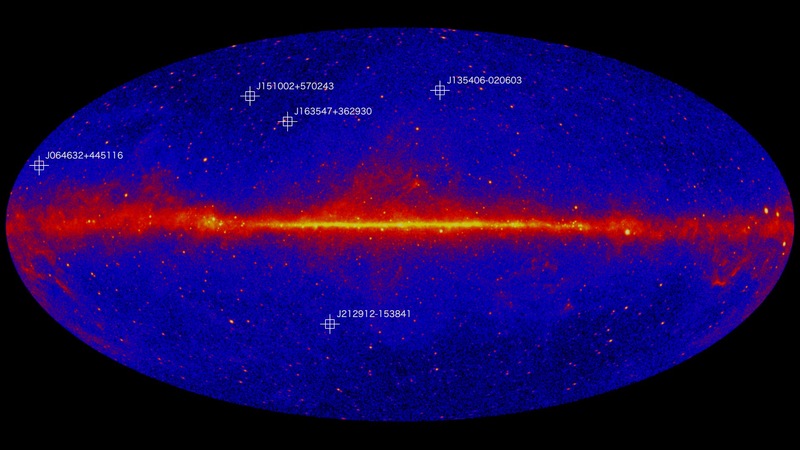 bright gamma ray glow from the plane of our Milky Way galaxy. Black holes are famous for devouring anything that gets close to them, but some super-massive black holes are also able to launch matter very far away and at incredible speeds - close to the speed of light. They do this by accelerating matter in narrow beams (called jets) that can extend from the poles of the black hole for hundreds (even thousands) of light years. AGN with jets closely aligned with our line of sight are called "blazars" for the blazing light that we observe. Blazars are extremely bright at gamma rays and this explains why most of the AGN observed by the LAT belong to the blazar class. Your browser does not support the video tag. Downlaod the Movie. Read the Press Release. Jets require an enormous amount of power to be launched and for a long time it was unclear which energy source was used. Fermi-LAT observations have helped scientists understand that jets tap into the reservoir of energy that is stored in the rotation of the black hole. supermassive black hole. Some AGN have jets, while others do not. 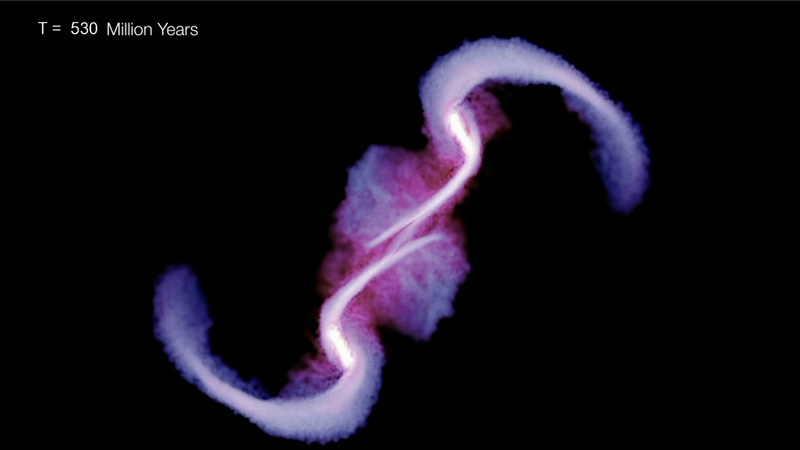 Blazars' emission is highly variable on time scales of minutes to years. These changes in brightness can tell us a lot about the workings of the blazar 'engine'. Some blazars even seem to show repeating patterns of variability. One of these is a cycle of ~2.5 years for a blazar called PG 1553+113. Such repetitive variation may be due to the presence of two black holes on a close orbit. Black hole jet activity may be triggered only temporarily due to some violent mechanism, like the collision of two galaxies. Since Active Galactic Nuclei are bright, numerous, and distributed across the observable Universe, they act as beacons bringing us information about the biggest questions in astrophysics: the early life of the Universe, the shape of space, and the nature of Dark Matter. AGN have told taught us a lot and look set to be unique tools for our continuing exploration of the mysterious Universe. Do tune in every Friday this month for more on Fermi and the study of AGN.